Carex E-Z Lock Raised Toilet Seat with Armrests is designed for individuals who have trouble bending into the sitting position. It adds 5 inches of height and fits most standard toilet seats. 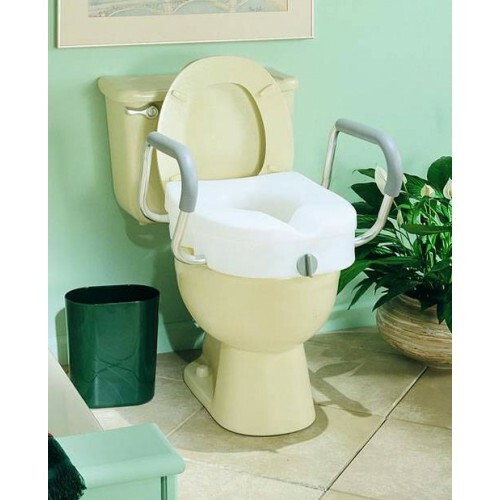 The E-Z Lock toilet seat riser is available with or without armrests. The width between the armrests measures 17.5 inches and they are padded for maximum comfort. It features an easy-to-use locking mechanism that secures the seat to the toilet bowl. The smooth contoured seat comes with built-in hand grips for easy handling. It is lightweight and easy-to-clean and maintain. The seat height measures 5 inches and it has a weight capacity of up to 300 lbs. 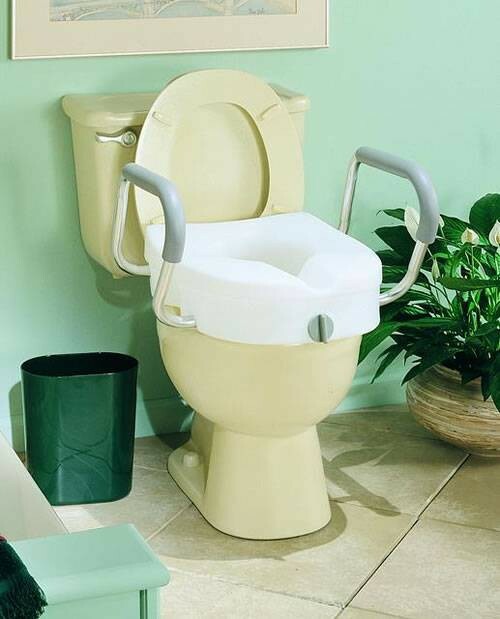 If you prefer a seat riser that is non-locking, you may like the MedLine Elevated Toilet Seat. Do I remove the original toilet seat? To clean it, can it be easily removed? Does it slip? The original toilet seat must be removed in order to properly install the riser. The riser can be removed for cleaning and has a non-slip surface. This is one of the best toilet seat risers around... easy to install, very stable, and the arms are high and to the front of the unit. HOWEVER... it is too short for the new elongated toilets. This elevated seat is easy to install and solves the problem of a person's hard to regain a stance. The side bars are strong and supportive, the raised seat easier to stand up. Highly recommended. Only con, it needs to be made for elongated seats also. I had hip surgery in 2011 and came upon this product through a loan. It is excellent and I would advise it for anyone needing less pressure on the knees, hips, etc. Once you get the old toilet seat off, it's easy to install and - so far - it hasn't wobbled. Our 90-year-old mother likes it a lot.